BANGI, 5 September 2014 – The National University of Malaysia Global Student Mobility Partnership programme (UKM-GSMP) ended here today with the hope that the students would better understand and appreciate the worlds’ biodiversity and cultural diversity. This was the sixth batch of international students who joined their UKM counterparts in the three-week programme beginning from Aug 13. 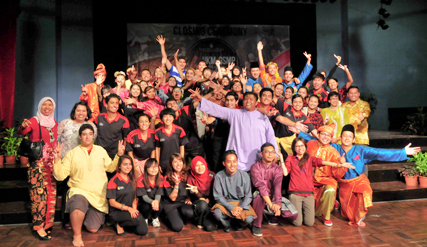 A total of 53 students, including 12 from UKM took part in this year’s programme. The international students were from Mexico, Hong Kong, Korea, Philippines, Taiwan, Turkey and Japan. Since its inception in 2009, a total of 265 international students from 16 countries have participated in the programme. This year the students were offered to choose from two programmes: the Indigenous Communities of Malaysia Course (ICM) coordinated by Prof Dr Junaenah Sulehan and the Sustainability of Tropical Heritage Course (STH) coordinated by Assoc Prof Dr Norhayati Ahamad. Under the ICM course they were brought to experience the life the Jahai Community in Royal Belum Forest in Perak as well as the Iban and Bidayuh communities in their long houses in Sarawak. While for the STH programme the students visited UKM’s Geopark in Langkawi and the Danum Valley conservation area in Sabah and briefed on their conservation and sustainable developments. Deputy Vice Chancellor (Academic and International Affairs) Prof Ir Dr Riza Atiq Abdullah O.K. Rahmat who addressed the students at the closing ceremony hoped they had enjoyed and benefitted from their visits to UKM’s Living Laboratories and other research and conservation sites. “We hope to see you grow into future leaders who will make the world a better place for mankind, where man lives harmoniously with one another and with nature,” Prof Riza Atiq said. Various departments in UKM were involved in programme including the International Relations Centre (PHA), the Institute of Environment and Development (LESTARI), Faculty of Sciences and Humanities (FSSK), Institute of Ethnic Studies (KITA), UKM Health Centre (PK) and the Dato Onn Residential College where the students stayed while in the campus. The closing ceremony was also attended by the Ambassador of Mexico, Carlos Isauro Felix Corona and Director of PHA Prof Dr Imran Ho Abdullah. Several students from the course were given the opportunity to share their experiences while in UKM and in Malaysia. Among them Myra Ithzel who related her experience saying: “we were put together on this journey in Malaysia as strangers but we ended this trip as a family. I have learned much while I was here. In Langkawi we had the opportunity see and experience the beautiful landscapes of the Geopark. “I believe I can speak for my fellow UKM-GSMP friends that through this experience we have learned to appreciate more our lifestyles that we already have and not whine about things, because we have seen there are those who live only with basic needs and yet they are happy. Every trip and every place we went to was an incredible adventure,” she said. The closing ceremony ended with the students showcasing their skills and talents in several traditional Malay dances and performed the Macarena and several Spanish songs.